The Pomodoro Technique is a time management technique where you jot down tasks on the list and work on those tasks in 25 minute intervals. You take a short break after each interval, and a longer break after four sessions. You can read more about the technique on the official website. 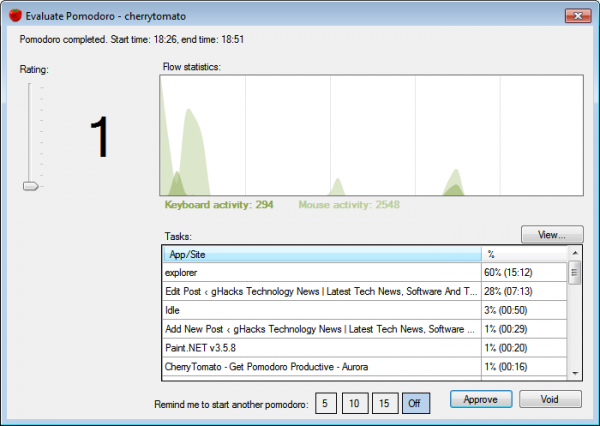 CherryTomato is an Open Source application for Windows that acts as a software based timer for the Pomodoro Technique. You still need to write down the tasks that you want to complete on any given day though. The program sits in the Windows system tray after installation. You start and stop sessions with a right-click on the program icon and the selection of Start Pomodoro from the context menu. The new session begins and a statistics window will be displayed after 25 minutes have passed. The program displays the keyboard and mouse activity in that time, as well as all applications and tasks during that time. This includes all web pages and programs that have been active during that time. Sessions can be rated and either approved or dismissed. Another option is a reminder that can remind you after five, ten or fifteen minutes to start another Pomodoro session. You need to start a new session the same way. This is probably the biggest usability issue as there is no option to use a shortcut or to automate the creation of new sessions. Whenever you are ready, you need to right-click and select Start Pomodoro. The program settings can be used to customize the program. CherryTomato will for instance indicate in Live Messenger and Skype that you are currently in Pomodoro to avoid interruption. This can be disabled. It is furthermore possible to create regular reminders to start a new Pomodoro session. Windows users can download CherryTomato from the develop website. The program is compatible with 32-bit and 64-bit editions of the Windows operating system. Alternatives that offer better automation are Instant Boss and Interruptron. Update: Cherry Tomato is no longer available. I suggest you use the alternatives listed above. The pomodoro technique is awesome. It is an actual time boxing that works, especially if you are someone who has a short attention span. I like how this program has graphs and more a visual look at your work. This is what other PT programs are missing. Lets you use the standard 25/5 Pomodoro or customize for longer and shorter intervals. Gets the job done nicely.